Whenever hubby’s got a hankering to search out and try a new burger place, I never get excited. Why? Because most burger joints forget that vegetarians have taste buds too, and that not all vegetarians want a mushroom burger. Burger Traditionalists, I know you don’t feel my pain and I get that. A burger is traditionally meat. But, we live not in a traditional world anymore! And trust you me, I’m tired of having a dried-out mutated veg patty in every veg burger I get dished up – it’s gettin’ really old!! Let me share the pain now, you beef patty lovers: It would be like you getting dished up the same insipid, pre-manufactured frozen patty over and over again regardless of where you went…wouldn’t you sing out…. What about me? It isn’t fair…I’ve had enough, now I want my share…!!!! 🙂 ha! Yeah, me too! 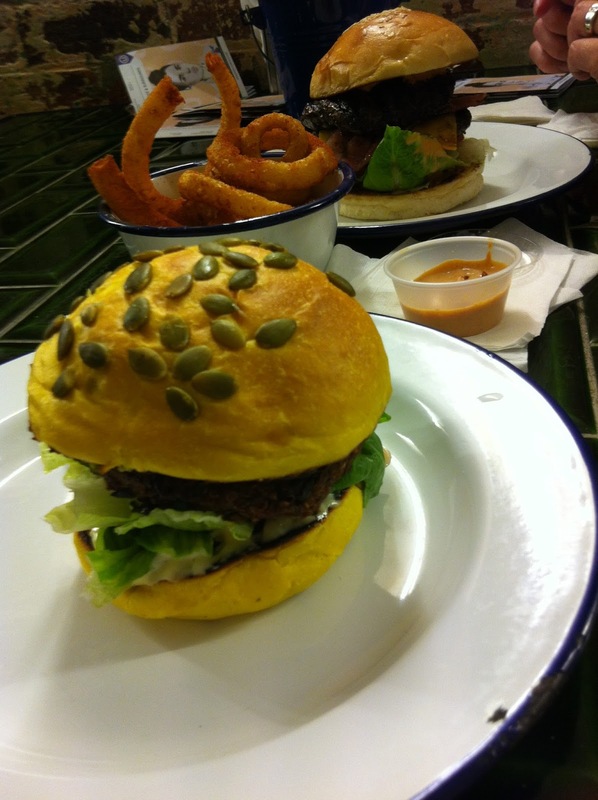 Thank you kindly, oh great Burger Gods, for plonking Chew Burgers down onto, uh, Plenty Road Preston? Okay, whatever. Who am I to judge the location?! Thank you for creating a place that will at least try to make a veg burger a bit different! So a little back story, on hubby’s first visit, he tried the The Chew ($12), 190 grams of juicy wagyu, lettuce, tomato, amazing tomato sauce, pickle, mustard, aioli and cheddar. It was so good he wanted another one, but propriety held him back, but not for long! So, on this visit, his grumbling tummy provoked him into The Plenty ($16), and boy, he was beside himself when it arrived on the table. Yup, Plenty it was with two fat 190g wagyu patties, bacon, pepper cheddar, lettuce, tomato, mustard onions. My heart went out to him though, watching him struggle to eat it; it seemed a great effort, and the battle to consume it was starting to outweigh its yumminess. The verdict? It was good, but The Chew was so much better in terms of ease of eating (something a friend of ours calls “Eatability”), and it was overall more tasty because the flavours were less overwhelming than The Plenty. What about me (heh, heh), the veg? Appropriately named, I tried The Vego ($13) which was cute with its little pumpkin seeds, looking a fair bit weaker than hubby’s monster. The Vego was stuffed with a black bean and quinoa patty, lettuce, cilantro, guacamole and salsa. How was it? I’ll have to say, it was one of the better veg burgers I’ve eaten out, and I’ll give them big props for making a black bean patty and not the other anomalous mushed-veg disc I usually get from other places. Verdict: nearly perfect, if they were more generous with the guac and salsa – I would’ve been smitten. I suppose I could always ask to go heavy with the Mex condiments next time, eh? Oh yeah! And we got a side of Onion rings ($6.50) that were sprinkled with smokey paprika and came with a spicy dipping sauce – they were awesome! Not a lot in the bowl though, so if you’re gonna share, don’t be shy, get your eat-on fast! Small but worth ordering for sure!! The fit-out? Classic Melbourne urban minimalist, slightly industrial cool – nothing exciting, but nothing you wouldn’t mind being spotted in. That’s if you can spot it yourself!